Security Setup – Messaging General (Replaces Email Control)Changing Email Templates. 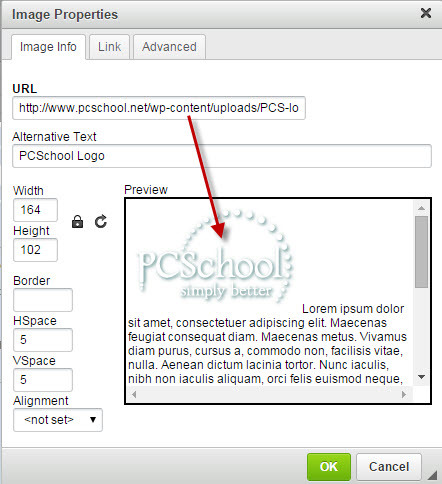 To add an image, first open the email template you wish to insert it into. Select the image to insert. A “Preview” screen will appear. Copy the URL of the image you wish to insert. This will load the image into the “Preview” panel. Once previewed, the image can be altered using the surrounding options and tabs. It can be resized, have a border and padding added. Once you are happy with the image settings, press “OK”. This will insert hte image into the template. Once inside the template, it can be moved to a position that suits. Pressing “Save Details” will save the template.